Wild neighbors such as the territorial squirrel can make their home right inside your favorite bird feeder. These quirky little animals are actually problem solvers and will challenge you every chance they get especially when it comes to food. If you want to keep squirrels off your designated bird feeders, you have to know how to beat squirrels at their own little game. Squirrels are like Houdini, they could probably figure out a rubix cube if you gave them time. They also can jump at least 5 to 6 feet straight up from the ground, from a house or a tree. Knowing they are up to Olympic challenges, we have a few tips on how to squirrel proof wild bird seed. This is easier said than done. You are going to have to place your bird feeder as least 10 feet from any kind of tree, bush, surface or fence. If the birds you are trying to attract to the feeder need a lower area or you have limited places to hang your bird feeder, then consider using a squirrel baffle. 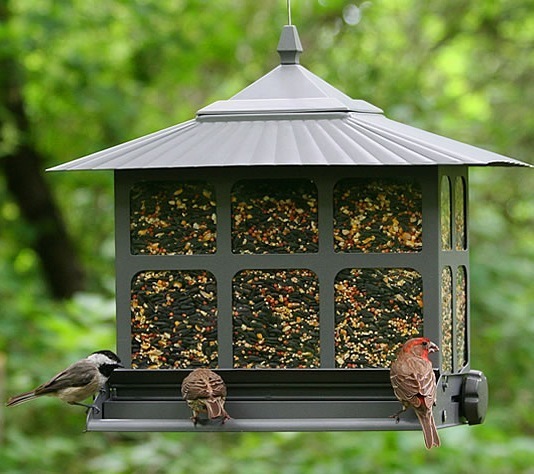 Baffling the little problem solvers with these cylindrical devices or domes make it difficult for them to access the bird feeder successfully. The way a baffle works is the squirrel attempts to climb onto the feeder, the baffle makes it nearly impossible for the squirrel to wiggle through to the food. When the determined hungry squirrel tries to push past the baffle, often they are dumped onto the ground from the rotating of the baffle. Squirrels, as mentioned, are so smart that some can actually figure out this method works for seed too. When the squirrels are launched onto the ground, some seed is dumped. In essence, the sly squirrel launches at the dome, bounces off, and dines off the seeds which were spilled on the ground. Birds are beautiful to watch eat and swoon around feeders and baths, but sly squirrels can be even more entertaining. Consider including squirrels into your environment. There are specialty feeders for squirrels available, or you could easily make one at home. Because squirrels are so territorial, if you feed them at their own dedicated feeder, away from your bird feeders, they will happily mark this as home and actually protect it from other squirrels entering your backyard menagerie. They would much rather eat from their own menu of favorites, then pick through bird seed. Squirrels love whole raw peanuts, sunflower seeds or cracked corn. Get a hanging platform feeder or a specialized squirrel feeder and enjoy the hours of entertainment squirrels can provide. Even as you welcome your wild neighbors to their own special restaurant, be sure to keep an eye on the events happening over at the bird feeders. If by chance a rebel squirrel is causing a problem, then try a squirrel baffle to discourage the behavior. Squirrels will continue to return to where their primary food source is, that is why having their own favorite menu items at their own place is a good solution for dealing with those hungry little bandits. Perhaps you have a dislike or fear of squirrels, if this is the case, and your squirrel baffle is not discouraging the seed thieving, try adding a tablespoon of cayenne pepper to 10 pounds of birdseed and mixing it well into the bird seed. The next time a squirrel comes to the feeder it will smell or the taste the hot pepper. They make come back a few times to check if all is well with the seed, but after a couple more tries they will surrender without eating. It does not bother the birds; they don’t even seem to notice the mild difference. The pepper has no effect on birds with the exception they certainly enjoy feeding without interruption. There is actually a specific hot pepper product made for discouraging squirrels from the bird seed with a hot pepper additive. Safflower seed is another ingredient you can use to turn squirrels away from your bird feeder. For some reason, they seem to be very bothered by safflower, so a little mixed in with your regular bird seed will be enough to discourage their bird feeder foraging. Some bird lovers have went as far as to oil their bird feeder poles, which causes the furry little bandits to keep sliding down and eventually giving up; for a while anyways. This is not recommended, as the oil causes their fur many problems. It is preferred to use less harmful, long term methods.